QUEENS, New York (WABC) -- Police are looking for a suspect in connection to a series of bank robberies in Queens. In each case, the individual passed a demand note to the teller. -- At 4 p.m. Sept. 30, the suspect entered Chase Bank, at 144-17 Union Turnpike and took $2,100 in cash. -- Around 2 p.m. Nov. 23, the suspect entered Chase Bank, at 196-03 Northern Blvd., in Maspeth, and took $5,000 on cash. 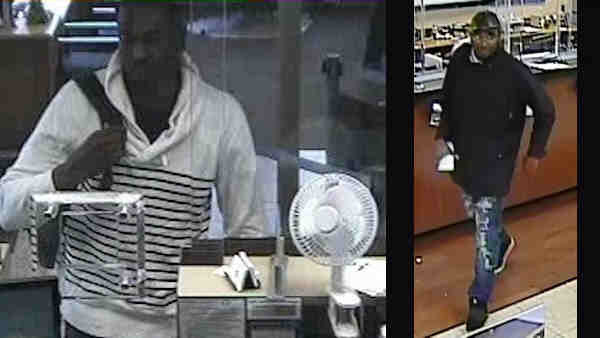 -- Around 3 p.m. Nov. 30, the suspect went into Chase Bank, at 184-01 Hillside Ave., and took $4,620 in cash. -- At 3:15 p.m. Dec. 14, the suspect went into Chase Bank, at 111-18 Liberty Ave., and took $1,000 in cash. He is described as black, about 35, 6 feet 5 inches to 6 feet 7 inches, and about 200 pounds. He was wearing a black waist-length jacket, blue jeans, and black sneakers.